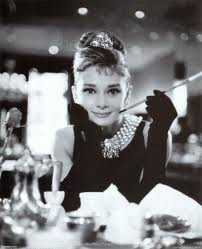 The classic 'Breakfast at Tiffany's' poster hangs above my bed, the protagonist, heroine, ingenue and icon mutely observing my daily life. La Hepburn is undoubtedly the world's favourite muse, and this I cannot argue with; I fell under her spell of simplicity, elegance and a Givenchy wardrobe a long time ago. No, what I disagree with is the lavish attribution of the term 'icon' to faces with less than 100% fashion credentials; the use of stylists is increasing evermore (to the extent that they themselves become the celebrity... Rachel Zoe, for instance) and true inspiration, creativity and sartorial savoir- faire is disappearing as quickly as the fashion victims appear. So I present thus: my own 'icons', presented as I see them and their individual effect on my personal style and fashion knowledge. Their 'credentials' are variable, but for me, each are sartorial geniuses and have inimitable individual style. Olivia Palermo, the quintessential Manhattan fashion girl; impeccably groomed, even more impeccably connected, she lives the socialite dream of endless parties, paparazzi and arm candy. However, she is also a lot more than that; her outfits are the last word in accessorizing, showcasing the newest of the 'hip' designers alongside highstreet and classic brands. Her signature, perhaps the very epitome of New York glamour, along with the glossy blow- dried waves of hair, is a fresh scarlet manicure- this particular habit cost me a bottle of red nail polish as I tried to emulate. Her style is 'high fashion casual'; never overdone, never try- hard, her polished manner of bringing together outfits in a way that is neither ostentatious or pretentious, but subtly chic, belying a style intuition that I can only dream of.